Hello there! I am back from the holiday break and am excited to share this sweet card with you! 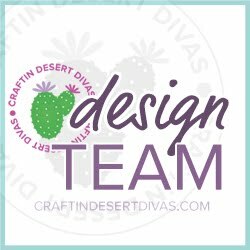 This week you will be seeing projects made with Craftin Desert Divas new stamps and dies. 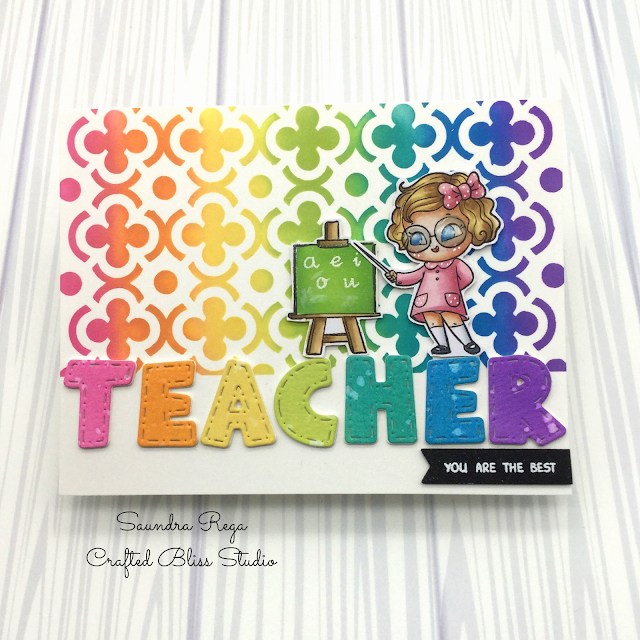 Today the designers are showing projects using the new Sweetest Birthday Stamps, Party Border Dies, and Party Time Stencil. All of these items will be available for purchase on Friday, January 12, 2018. Let me show the the full card! 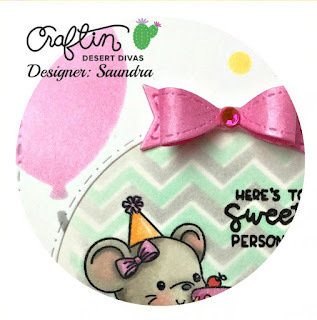 For this card I am showcasing the Sweetest Birthday Stamps and Party Time Stencil. I started with a panel and stamped the cute little mice then stamped again to create a mask. Once masked I used the CDD Sorted Shapes Stencil and some Ranger Distress Ink to create my wallpaper. Ink colors used were Cracked Pistachio and Hickory Smoke. For the floor I used Antique Linen and Walnut Stain. My images were colored with Copic markers. Aren't these mice sweet! I took another panel and used the new Party Time Stencil and some Dew Drop Brilliance Ink in Pearlescent Orchid and Galaxy Gold. I used a sponge dauber and was a little selective only applying ink in the spaces I wanted. Once completed I used CDD Fancy Frames Dies to diecut the panel. 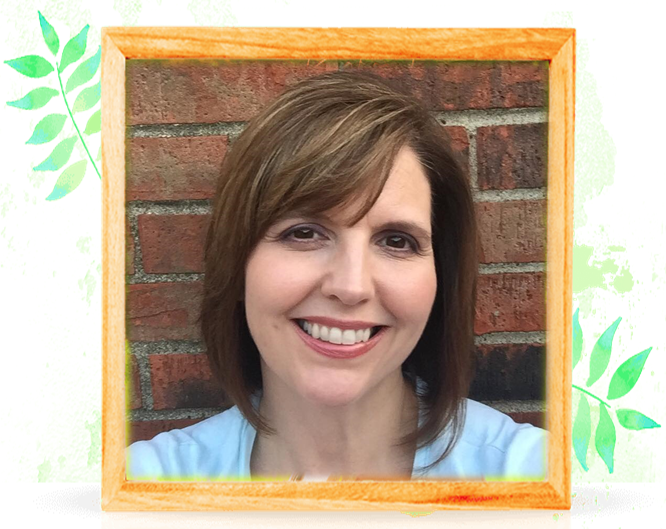 I used a circle die from CDD Stitched Circles Dies to create a window in my panel. 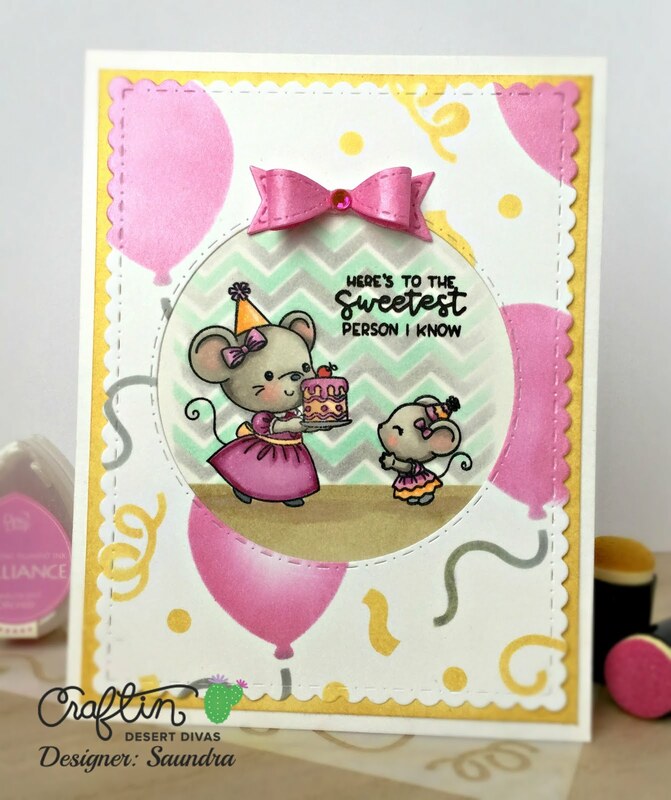 The same Dew Drop Brilliance ink was used to ink up a layering panel and some cardstock to match the balloons and confetti. I layered everything together and added my sentiment from the new Sweetest Birthday Stamps and a bow that I die cut from CDD Shaker Tag Dies. Just a touch of Clear Wink of Stella here and there and the card was complete! Stay tuned this week as I have more projects coming from this new release! Please note that this post does contain affiliate links. You will not be charged anything extra by clicking them.